Bedlam Theatre is Edinburgh’s entirely student-run venue with a fully operational 90-seat auditorium housed in an imposing neo-gothic church. Both listed building and historical landmark Bedlam is also a unique space and community, home to the hugely respected Edinburgh University Theatre Company. These days Little Englanders have never had it so good, which of course sticks in the craw. Well, it might, and it should, particularly if you’re from Tristan da Cunha and want to get home. You won’t get far via Google maps – try it: Edinburgh, Scotland, to Edinburgh of the Seven Seas, furthest South Atlantic. Add it up in stages: Edinburgh to Cape Town is 8,900 miles and then from the Cape to the UK’s most remote overseas territory is another 1746; a total of 10646 miles. 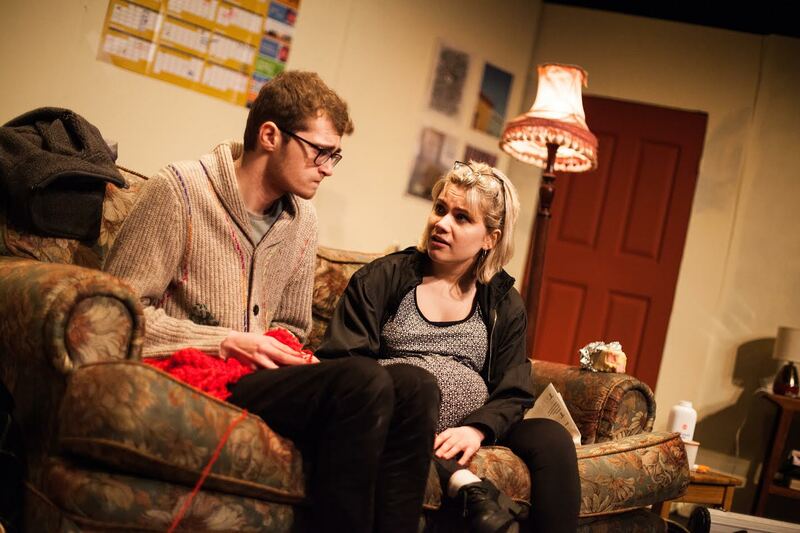 Zinnie Harris’ fascinating and celebrated play certainly goes the distance and has considerable appeal and for a student company to attempt the same without the scenic resources of the professional theatre is quite some going. This is intrepid work by directors Jess Haygarth and Aggie Dolan. ‘Drips and drips’ begin the first half of Further than the Furthest Thing and then there’s a homecoming. Francis, 20 something, comes back to Tristan and to the girl he left behind. The tiny population lives off its potato ‘Patches’ and from its crayfish catch. Resources are scarce and timber has had to be taken from the church roof to make a coffin. Wistful cello, flute and violin accompany the sound of the waves but this is not Eden. There’s rumbling thunder and something is definitely not right up on the mountain. Bill Lavarello, a village elder, has heard the lake churning, and that is a bad, bad sign. Perhaps God is angry for what the islanders did some twenty years ago; but for now a businessman, who got off the ship with Francis, has a plan for them all. Then nature expels him and everyone else. Mr Hansen is the unsmiling factory owner who can make eggs disappear. Harry Richards plays him as an Economics major, disciplined, good with manila folders and with a dismal hold on emotional intelligence. Nevertheless, Hansen would seem to offer change and prosperity and he almost does. Variation-on-Kraftwerk’s Robots opens the second half in Hansen’s UK bottling plant. Young Geographers will know that the characters have left the global south. Sociology freshers will recognise anomie, although This is England it ain’t. Folk are displaced when work is directed from behind desks. Bill is told that he has a ‘good’ job tending pipes in the boiler room and his wife Mill is offered the almighty vision of a fitted kitchen in affordable housing. A younger couple, Francis and Rebecca, determine to return to their ‘Village’, to that other Edinburgh far, far away, but have they missed their ‘time’? Bill (Oscar Gilbert) and Mill (Tiffany Garnham) are at the play’s centre. Bill has faith (and guilt) whilst Mill is shrewder, more adjusted. “We is from England now”, she says, employing the island dialect that characterises their speech and their shared past. There is a plain innocence to them and to their relationship that young actors can respond to very well. Francis (Rufus Love) is their strapping nephew who, whilst away in South Africa, is horrified and hurt by common, filthy, English usage. He is the conflicted one but it’s probably Rebecca who suffers the most and Anna Swinton acts her heart out in the role. You may gather that this is a BIG and serious story for a small stage. Go deep, as poor Bill does, and you’re into the Book of Genesis; stay at the shallow end as I did, intrigued by the utter Englishness of folding picnic chairs, and you’ll hear Lennie in Of Mice and Men asking ‘How it’s gonna be .. [&].. tell how it is with us’. And so, uncomfortably, as scene follows scene (reckon on 25 plus) it is all in the telling. Should it sound quite so educative? Earnest speech delivers premonition just as effectively as the horrific promise that Rebecca demands of Bill, and the speech is unrelenting. The drama just gets too wound up, is constantly interrupted by shifting table and chairs, and looked far from easy. It became long and portentous and beyond what an EUTC production, however devoted, should attempt. Only sardonic tea with Mill, Rebecca and Francis provides light relief, that and the happy injunction to ‘Feel like Britons’, even when naked. There’s a virtual Hall of Fame in this show: Brecht, Weill, Lotte Lenya, to start with; and a few music greats – Ella Fitzgerald, Ray Charles, Sinatra – and then Kevin Spacey as Bobby Darin with the title song. If you want more, there could be Tony Bennett and Lady Gaga’s The Lady is a Tramp and a passing literary reference to Raymond Chandler’s Philip Marlowe. Nathaniel Brimmer-Beller would channel them all through his play. It’s a clever and applaudable conceit but the interference is too much. Too many signals from too many sources. A mellow jazz intro’ – nice – leads into Oh, Lady Be Good which given what follows is practically hilarious. ‘Lady’ sings that she’s ‘all alone in this big city’ but for all her lonesomeness she is plainly making out just fine. It helps that the competition in the other clubs is thinning out, alarmingly so in fact, and the police appear clueless. Detective Foster (Paddy Echlin) likes his work. He’s had lessons in psychological profiling and Jack the Ripper is on his mind rather than Georgia but he’s a poor sap. He has the sharp trench coat and the 50’s trilby but is not the hard-boiled character that he thinks he is. More a marshmallow with a toy gun. Deacon (Jacob Brown), Lady’s trumpet player, is more on the case and knows a set-up when he sees one but unfortunately his incredulous WTF’s don’t help him. As for Lady, ‘the hottest ticket in town’, Jo Hill enjoys herself. She’s sassy at the mike, sings confidently, and is audacious beyond reckoning. And here’s the rub. Lady’s luck – call it ‘cool’ if you must – is something else. It turns tension into the comic macabre, not least when she kneecaps herself and stays on her feet. Maybe her aim was off but even a flesh wound must hurt like hell. Then there’s the absolute gift of a police detective who ‘packs heat’ like Clouseau on holiday. Will Briant on piano and Vebjorn Halvfjierdvik on bass give the piece a tempo and style that if extended – for the Fringe, say – could lift the play into the lighter, skilful register that Brimmer-Beller is reaching for. 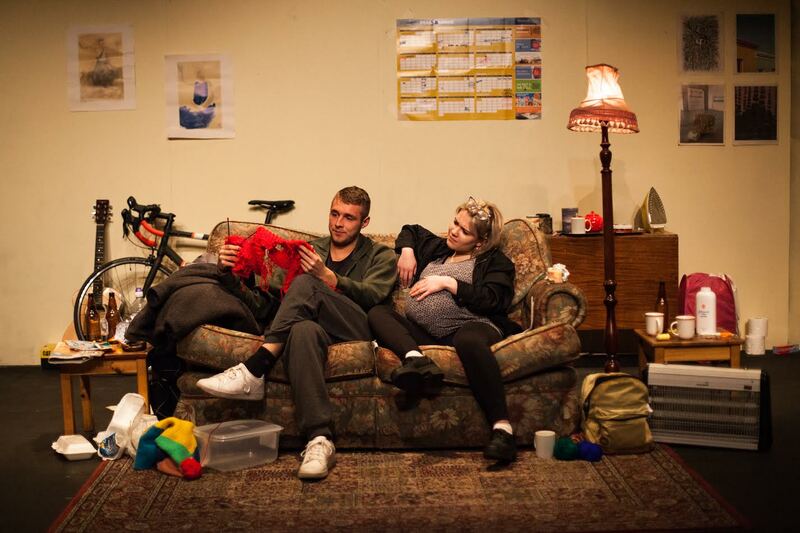 I was quite apprehensive before taking my seat, as to how Edinburgh University Theatre Company would present the strong, emotive themes of trauma, abuse and love in David Harrower’s intense two-hander. With the entire play focusing on one conversation between the two central characters Ray and Una, how well would the actors sustain and communicate this challenging piece? The plot sees Una (Sophia Dowson-Collins) seek out Ray (Benjamin Aluwihare) to confront him about the sexual relationship they had fifteen years prior – when she was only a 12 year old girl whilst he was a grown man of 40. She wants to face the past but he is at first unwilling to speak to her. As the play progresses they both go through a range of emotions, sometimes screaming at each other and at other times talking calmly about trivial things, creating a dramatic if at times, confusing dynamic. The script is complex, taking a while to build and reel the audience in before taking a deeper and darker turn. We get to piece together more about the identities and personalities of both characters, and some surprising twists and turns reveal the truth of what happened fifteen years ago and how both characters have dealt with their experiences since. 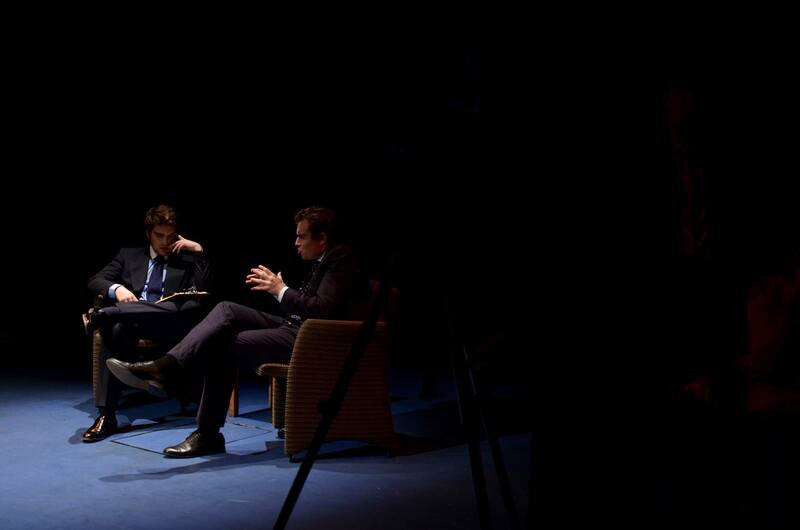 The silent captivation from my fellow audience members throughout told its own story: at times there was perceptible discomfort, and I personally found the whole thing quite awkward and difficult to watch, but only because the performance felt so real. Although both performers did well I was particularly impressed by Dowson-Collins’s performance: at times there were long streaks where only she would speak – sometimes to Ray but often more like she was speaking to herself. She was captivating and consistent throughout, bringing a great sense or realness to her character. Aluwihare seemed nervous and awkward for the most part and although fitting with Ray’s character, it was difficult to tell how much “acting” came into play. The set was perfectly suited to the action: it was very simple with just a couple of seats, a table and some office lockers, making the actors do the work to convey the story. In saying that, what didn’t work so well was the use of a plastic sheet hanging behind Una and Ray, from behind which a girl would appear to represent Una becoming a ghost of herself through everything she had experienced. Although I could see what the production was trying to do I felt like this distracted from the dialogue between Una and Ray, and a more creative way of expressing this idea could have been used to greater effect. All in I was very impressed by the performance. The themes may not be to everyone’s taste, but it was still a fascinating watch. 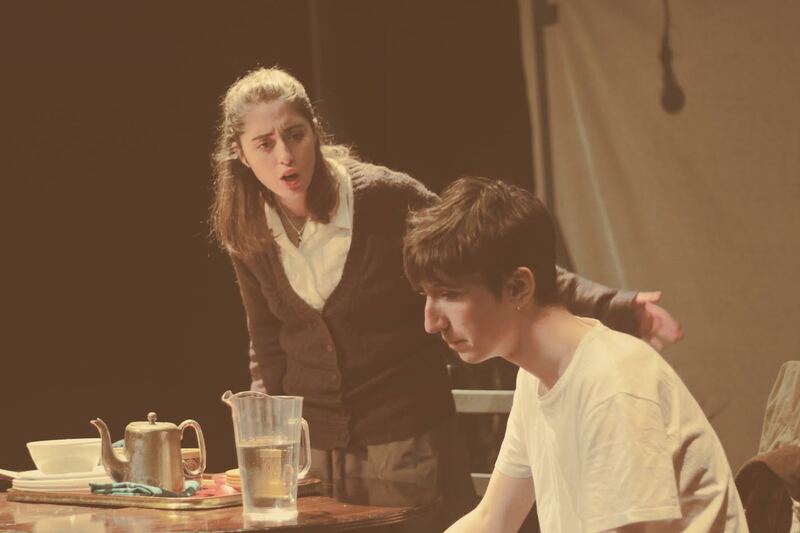 One certainly cannot fault the courage of the students at Edinburgh University this year for taking on so many challenging productions, and to even attempt Beckett – whose works so often have age and world-weariness as themes – is admirable. I was lucky enough to spend an entire term studying Beckett at university, under the tutorship of a renowned expert on his works, but even then I worried that my final performance would be a tragic, naïve offering compared to what had gone before. Beckett certainly isn’t for everyone, and Endgame is a one-act play with a running time of close to 90 minutes that has very little narrative development or real “action”. What is most satisfying about this production is the group’s sensitivity to Beckett’s text. The great man is notoriously particular about how his work should be performed, and Edinburgh University Theatre Company don’t try any tricks or fancy interpretations to make it new or innovative, but instead use subtlety to let the text speak for itself. Finlay McAfee’s masterful direction teases out various interesting repetitions in the dialogue and hints at some of the political undertones, but never makes bold statements or suggestions. In saying that, this production also doesn’t take itself too seriously – it’s littered with comedic moments, just as Beckett intended, and is a very well-rounded and watchable show. Sarah Brown’s set is simple yet effective, using black and white as a nod to the “game” element, while all other creative elements are in sync to present a cohesive and professional mise-en-scene. Thomas Noble as Hamm is the centrepiece of the actors – always on stage, centre stage, he commands attention with charisma and gusto. His moments of anger when flinging props aside are powerful, while he shows great contrast in more intimate conversations with Clov. 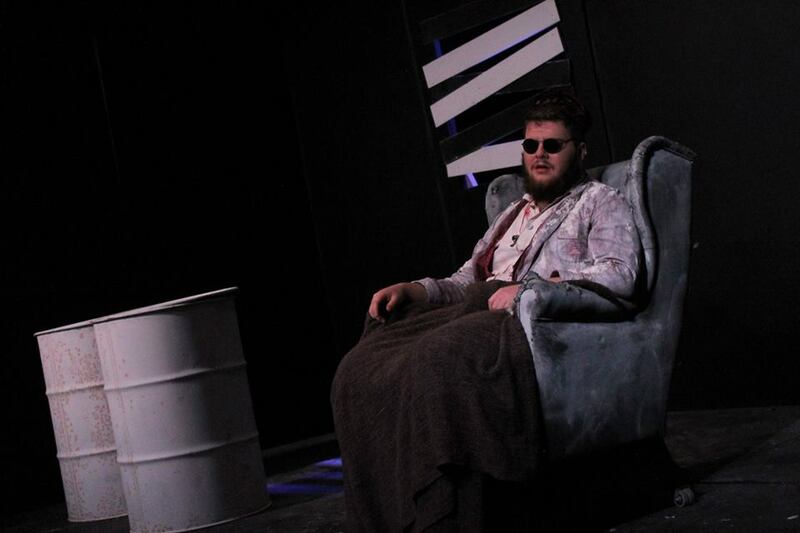 In turn Clov (Michael Hajiantonis) is excellent as the down-trodden servant, whose development in confidence towards the end, extreme physicality and impressive Irish accent all contribute to a commendable performance. Jennifer Jones is compelling to watch as Nag, with fantastic control over the small movements and expressions she makes inside the bin. Her physicality is exquisite, and her delivery of the tailor story is achingly on point. Antonia Weir is equally captivating and convincing as long-suffering wife Nell. To me the only thing lacking from this production is a deeper sense of age and timelessness. The action all seemed a little too fresh and perhaps a touch too “performed” for it to be believable as a snapshot of continual drudgery. In saying that, I’d much rather a slight tip in this direction to keep it energetic and engaging rather than veering down the road of self-indulgent dawdling. In all other respects this show is hard to fault, it’s certainly the best student production I’ve seen in quite some time. If you think a log cabin Republican is the kind of guy who would fire off a Patriot missile at a low flying angel, that would be way, way off target. And what would be his (her?) Democrat equivalent? I dunno but it might involve tepees and he / she might major in lines like ‘Respect the delicate ecology of your emotions’. You get both sorts on the Bedlam stage this week. Yay! This is Tony Kushner’s cultural blockbuster of a play from the early 90s: that’s actually two plays, Millenium Approaches and Perestroika, with a runtime – then – of around seven hours. 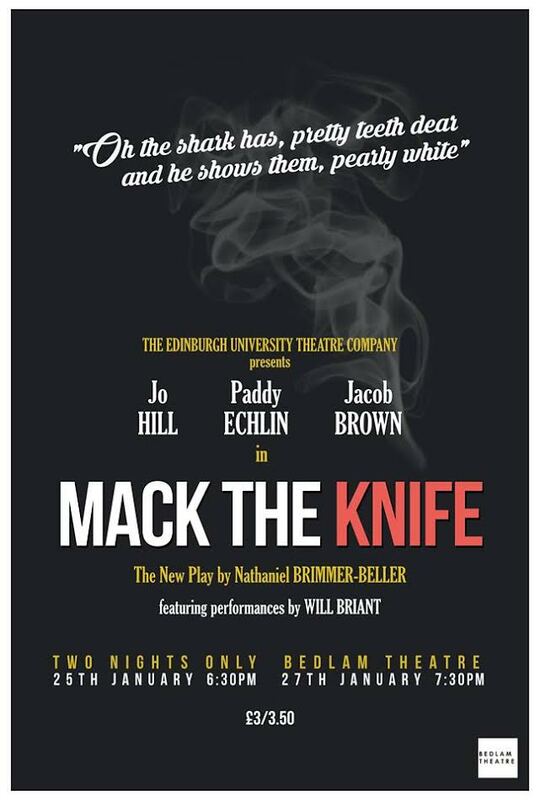 See this EUTC production, ably directed by Liam Rees, and you’re done in just over three hours but you will probably want to know what has had to be cut. (There is the made-for-cable HBO miniseries that might help and you won’t have to suffer the Baltic temperatures of Bedlam, although the scenes in Antarctica might feel familiar.) In the original script there are 67 scenes for two characters and that’s more or less how it all proceeds, two-handers with stand-out monologues for the principals. It’s sharp, witty, political, and yet manages to shade from the domestic to the mythic. Its subtitle, ‘A Gay Fantasia on National Themes’ sets the scene. To begin with it is 1985, Cats is going strong on Broadway and Ronald Reagan is President. In New York City Prior Walter – latest of the Walters who got off the Mayflower – is getting sick from AIDS and his partner of four years, Louis Ironson, is not coping. Lou works in the same building as Joe Pitt, a legal clerk, who is offered a big move to Washington DC by his powerful associate and friend, Roy Cohn. Joe does not know if he can take the job because his wife, Harper, is popping Valium like there’s no tomorrow. You are never entirely sure how many tomorrows Prior has left, not least when he’s visited by two ancestors in black capes who regard his pestilential condition as entirely befitting a sodomite. Angel wings hang above the stage and at the close a tremendous thrumming heralds the arrival of the ‘Messenger’. In all likelihood the bearer of glad tidings has arrived but there have been angelic voices before and Prior, bless him, has no idea what they’re talking about. The excellent cast does not leave the stage which works well to impress a sense of full-on, marginally dislocated action. Prior’s sick bed stays up centre throughout. Brooks Hudgins plays the stricken WASP with timing that stings and with biting bittersweet delivery. Abandoned by Louis, he muses on his desperate isolation: it’s a sad joke that his dermatologist is on a [long] vacation in Hawaii and his mother … well, his mother just stays away. Rob Younger as Louis has all the lines and tousled angst of a Woody Allen character. It’s a kind, thoughtful part, full of faltering starts, punctuated by ‘Okay ..’ and ‘Right ..’ as he tries to explain himself. 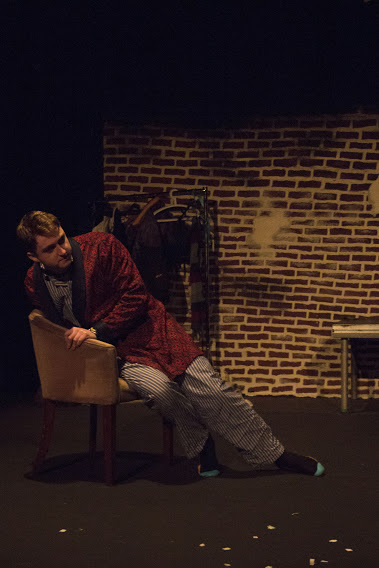 At home, stranded in her Brooklyn apartment, Emily Deans is outstanding as Harper Pitt, managing her depressive state with what amounts to mischievous glee in pyjamas and spotted dressing gown. Andrew Hally as husband Joe has to behave decently against demanding odds and more insuperable than even his Mormon upbringing or his sexuality is the foul mouthed, monster ego of Roy Cohn. The fact that Al Pacino took this part gives you a measure of what Peter Morrison has to do and he does well, lurching from one ghastly judgement to the next upon what’s rotten in the land of the free. It is not at all difficult to realise that Cohn (1927-1986) was a real-life horror show. 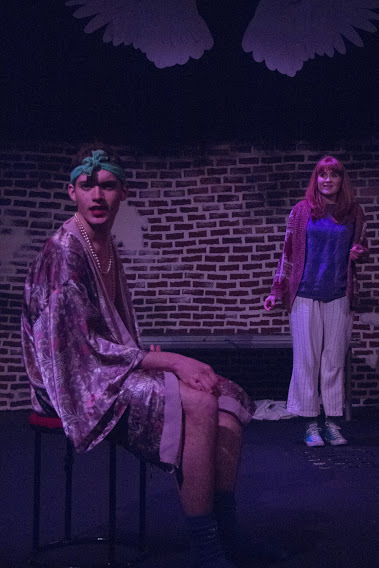 Supporting roles by Meera Munoz Pandya (notably as Belize, onetime drag queen, Prior’s ex-boyfriend and best friend) and by Erica Belton are clearly defined and remarkably effective within the significantly reduced script. The inevitable problem in this half and half version of Angels in America is that the impact of the ‘blockbuster’ cannot be the same as it was when young Americans were all ‘Reagan’s children’. It even predates Friends for heaven’s sake! The angelic chorus gets muffled, as it certainly did up in the rafters of Bedlam. Exhortations to ‘Look up, look up’ did not just baffle Prior Walter. Nevertheless, when ‘Modern Studies’ in many a Scottish high school can still stop at JFK’s assassination and when HIV infection and AIDS simply register as component parts of the Health and Well Being curriculum, this EUTC production is important work.